Camosun/VIATeC Trades & Technology Career Fair Thursday, April 9 @ Interurban Campus, Technologies Centre, 10am-2pm Sponsored by VIATeC and presented in partnership with the School of Trades & Technology, this year’s Trades & Technology Career Fair will bring together specialist employers who want to connect with you and share career options in their organizations. You’ll have a chance to hear presentations in areas such as renewable energies and learn more about trends in the trades & technologies workplace. This is your chance to mix and mingle with employers and secure your career future in your chosen field of study. The Greater Victoria Public Library website now has a page that lists upcoming multicultural events. Check it out here. The Vancouver Island Health Authority (VIHA) is holding a career fair on March 9th. VIHA is one of the largest employers on Vancouver Island with over 15,000 workers. Beyond medical professions they hire tradespeople, administrative and other non-medical support staff. For details on the career fair see their poster(pdf). Also check out their public job postings. Another tourism industry job fair has been announced. This one is with Butchart Gardens. See this link (pdf) for details. 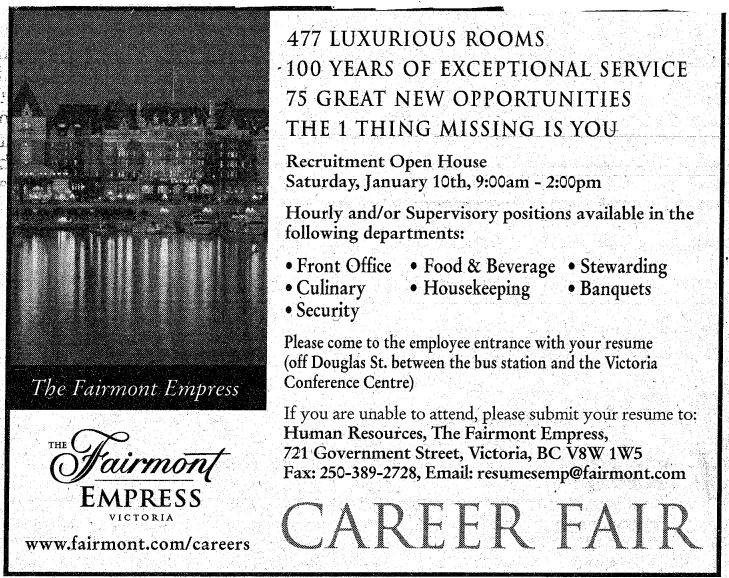 Those of you who work in the tourism sector will want to note that the Empress is having a Career Fair this Saturday. Apparently there are many opportunities for both hourly and supervisory positions. Click the ad that ran in yesterday’s edition of the Times-Colonist to see it full-size.